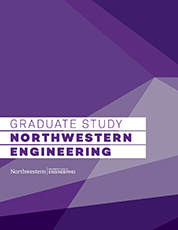 Phoebe Evans graduated from Northwestern with a bachelor’s degree in mechanical engineering and a master’s degree from the Engineering Design Innovation (EDI) program in 2017. As a student, Evans worked in the Ford Rapid Prototyping Lab, where she helped her fellow Wildcats leverage additive manufacturing to create prototypes. Since graduation, she has worked as a Breakthrough Technology Process Engineer for Mars Wrigley Confectionery, the world’s leading manufacturer of chocolate, chewing gum, mints, and fruity confections. 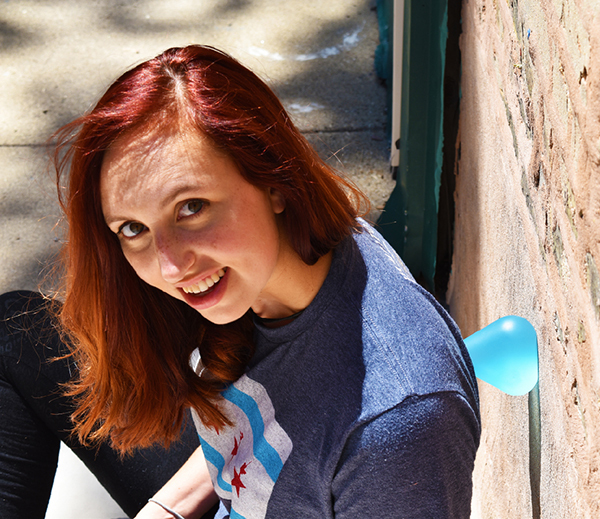 In her spare time, Evans has collaborated with another Northwestern alumnus to develop her thesis project from EDI, Gumdrop, and bring it to market. Keep reading to learn how Evans became inspired to create Gumdrop, how her time in the EDI program shaped her growth as a designer, and what's next for her. How did Gumdrop first come about? Gumdrop was my EDI thesis project. Initially, I set out to create a product that would improve the rehabilitation process for athletes. Over the course of observations and interviews with Northwestern athletic trainers and Northwestern Club Ultimate Frisbee athletes, I found that soft tissue massage was common practice and a key component of many exercises prescribed to the athletes for recovery. The primary tool recommended to complete these exercises was a lacrosse ball. I thought that this was a prime design opportunity to create a product that was actually fit for the purpose. The solution needed to be versatile enough to target the range of affected areas for these athletes and portable enough so that it could be taken with the athletes in their sports bags and backpacks. I also wanted the design not to look overly medical and intimidating to the athletes. 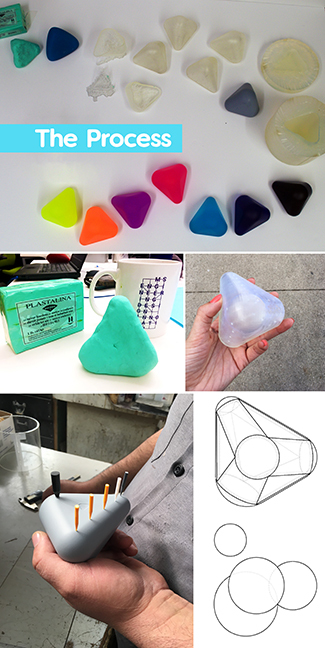 After multiple rounds of prototyping and testing with all these considerations in mind, the Gumdrop shape was conceptualized—a tetrahedron with different radii at each vertex. How did you go about creating Gumdrop as an EDI student? Yes, prototyping is my favorite part of the design process! I started formulating what I wanted Gumdrop to look like by using clay because it was a quick and dirty way to discover the handheld size I wanted to achieve. Once I had the form that felt right, I was able to measure that and use it to inform my first SolidWorks model. I then 3D printed a hollow version to minimize material usage on one of the more cost-effective 3D printers (Form 2) in the rapid prototyping lab. The first model I made was more organic and had curved sides that ended up not being very stable when used against a flat surface, so I went back to the drawing board and made sure to keep stability in mind while creating an improved model. After fixing the model, I wanted to experiment with different-sized radii to make sure I would get the right sizes for maximum versatility and function. I tried three different variations (also printing them hollow on the Form 2) and then was able to choose the best combination of radii. Finally, I printed a solid version of my optimized form on the Objet in the rapid prototyping lab. Partnering with Hatcher Associates, a prototyping shop in downtown Chicago, I was able to make a silicone mold using the final printed shape as a pattern. This mold allowed me to cast polyurethane Gumdrops with a range of durometers so that I could get the softness that would be most effective for soft tissue massage. The whole process really pushed me to the limits of my prototyping knowledge. It would not have been possible to create Gumdrop without the help from the wonderful people at Hatcher, the use of Northwestern’s Rapid Prototyping lab as well as all my EDI classmates and ultimate frisbee teammates who allowed me to test the prototypes with and on them every step of the way. How did the process to create Gumdrop evolve after EDI? The creation of Gumdrop has evolved a lot since graduating EDI even as the product has stayed the same, as I have been working to build a brand, website, and company to support its growth. Almost immediately after graduating, I partnered with Arjun Vellayappan, a good friend and fellow Northwestern alumnus, who was an Economics major and interested in the business side of starting a company. Together we started Simple City LLC, filed for a provisional patent, and sold out of our initial production of about 50 Gumdrops that I made myself using two molds from Hatcher Associates. Since there was so much excitement around our first set of products, we were inspired to search for manufacturers who could help us grow. We are about to finalize a manufacturing agreement with a family-run manufacturer in Michigan and have launched a Kickstarter to fund this next production run. What courses from the EDI program have been most impactful for your growth as a designer? The studio classes really helped build a strong understanding of what I needed to think about when designing a product. It is not just the product itself but the service and interactions surrounding it that are all a part of creating a great experience. I really try to keep that in mind as I design anything in my full-time job as a Breakthrough Technology Process Engineer at Mars or when working on personal projects. As corny as it sounds, I was also very inspired by all the wonderful EDI classmates I had, being surrounded by that much creativity and passion pushes you to work harder and dream bigger in all that you do. On a more practical note, Adobe Illustrator and Photoshop which we learned in our Design Communication and Methods class have also been more helpful than I ever would have expected. I have used those tools quite a bit to design the Gumdrop Kickstarter and they have also been useful for much of the content that I create at work. What connections from the EDI program were most helpful for you? Martin Rathgeber, my thesis mentor, was definitely one of the best connections I made to the Chicago engineering/design industry. In addition to being incredibly helpful while developing Gumdrop, he was a personal mentor to all of his mentees when it came to giving feedback on resumes and introductions to industry contacts. One of the best things about the EDI program, besides being surrounded by extremely talented classmates, was how invested the Northwestern-affiliated faculty were in your success. When I announced my first small production run nearly 6 months after graduating three Northwestern professors reached out, excited to support the product. What's next for you and Gumdrop? How can people support your project? Our next steps for Gumdrop are centered around our Kickstarter launch. You can support Gumdrop by backing our Kickstarter and getting a Gumdrop (or five) of your own or even just donating $1 to help our visibility. Other ways to help would be sharing our campaign on social media or through email to get the word out or just following us on Facebook and Instagram for future updates.